Welcome to our operator guide on load securing. The securing of a load should be of primary concern for all road users, whether using a seatbelt to secure our loved ones in the family car, or transporting groceries in lorries to the local supermarket. Not only does effective load securing prevent goods from falling onto roads causing danger to other road users, it also saves money by ensuring that goods arrive at their destination undamaged. This guide sets out to complement existing Department for Transport (DfT) guidance and the European Commission (EC) code of practice, providing operators from different sectors of industry with useful information on how DVSA and other regulators expect loads to be secured when in transit. This guide was compiled with the assistance of industry experts and other key stakeholders and should be viewed as part of the suite of DVSA publications dedicated to giving useful information to operators, drivers and other parties involved in the carriage of goods by road. I am pleased to be able to introduce this new DVSA guide to load securing, which plays a vital role in keeping our roads safe. The operation of all commercial vehicles carries some element of risk and operator licensing is designed to reduce this as much as possible. Taking steps to address the risks associated with load securing is a critical component of your responsibilities, whether as a licence holder, transport manager or driver. Health and Safety Executive (HSE) statistics show that workplace transport is one of the highest risk activities. This load securing guide sets out the DVSA’s approach and how to deal with certain types of load, including industry specific guidance for a wide range of sectors. Please use this guide to check and if necessary improve your current procedures and educate your staff and manage the risks that can arise if a load is not secured properly. FTA has welcomed the opportunity to assist in the development of this DVSA load securing guidance which will assist operators in the transport and supply chain industry in understanding some of the methods of securing loads, and to improve compliance with load securing standards. The guidance is primarily aimed at general haulage operators and contains some good practical advice for FTA members which provides them with information regarding securing loads in curtain side vehicles used on pallet and general haulage type operations which is welcomed. The RHA were pleased to be associated with input in producing this guidance, which it is hoped operators will find easy to use and understand with a resulting improvement in secure and safer loads across industry. 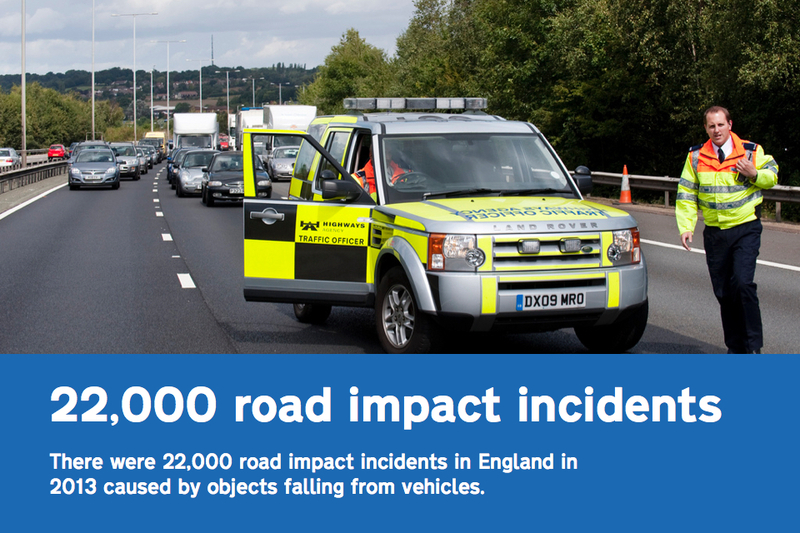 This guidance has been produced by DVSA and representatives from the transport industry. The subject matters chosen were the areas causing the greatest industry concern. These more comprehensive documents underpin the current approach to enforcement and should be familiar to anybody involved in the movement of goods via the road network. For the benefit of this guidance any reference to a vehicle should be read as any vehicle, trailer or combination unless specified otherwise. Whoever is responsible for loading a vehicle needs to consider other important factors like axle weights and vehicle stability. These are the fundamental requirements in making sure vehicles are safe before starting a journey. You should consider the types of loads being carried when buying vehicles. There are aftermarket products which can provide bespoke securing products to adapt vehicles to ensure they’re fit for purpose. There are also specialist companies who can give advice on the right load securing system for your operation and the loads you carry. The relevant trade body for your business may be able to help their members. The load should be loaded against the headboard and with the centre of gravity as low as possible. If the load is not against or above the headboard, think about how you can stop the load from moving forward. You may need extra lashings, sails, chocks or blocking. Whatever method you choose, the load restraint system needs to secure the load to the vehicle chassis. Not all loads are the same and not all vehicles are the same. Webbing straps or chains are common ways to secure loads, but they aren’t necessarily right for every load. For example, crushable or live loads need different securing methods. Incidents happen when drivers and operators underestimate how much restraint is needed to keep a load on the vehicle. Dynamic forces are much higher than static forces. So for example more force is required to secure a load when it is moving (dynamic) than when it is stationary (static). Reporting near-misses and other issues (eg restricted access to delivery sites or cambered delivery sites) can prevent those becoming incidents. A loading plan that travels with the load can be useful for everyone involved. The combined strength of the load restraint system must be sufficient to withstand a forwards force not less than the total weight of the load to prevent the load moving under severe braking, and half the weight of the load moving backwards and sideways. Even at low speeds, the forces acting on a load when the vehicle is moving can be high enough for the load to move. Heavy loads can and do move and the weight of the load alone should never be relied on to hold the load in place. Once moving, forces to prevent the load from continuing to move are much higher than if the load was static. Everybody in the transport chain should make themselves aware of the requirements set out in the DfT code of practice: safety of loads on vehicles. They may also find the the European best practices guidelines on cargo securing for road transport (PDF, 24.9MB, 96 pages) helpful. DVSA regularly updates its ‘Moving On’ blog which gives official advice and information for lorry, bus and van operators and drivers. You can also sign up to get email alerts when new posts are published. The trade associations also provide regular updates. Risk assessment is a legal requirement that helps you to identify issues and take reasonably practicable steps to control the risks. This should help reduce the chances of problems occurring, but you should think about what happens if the load shifts in transit. Drivers should not be expected to deal with an unsafe load alone at the roadside. Read guidance about risk management on the HSE website. If the drivers do not load the vehicle ideally they should be given the opportunity to observe the competent person loading the vehicle. If it’s not appropriate for the drivers to watch the loading then they should be given information about how the load has been secured and/or given the chance to check the load prior to departure. Drivers should be asked to report load shifts so that you can take action to deal with it safely and stop it happening again. Loads can move even under normal driving conditions so don’t automatically assume the driver is at fault if the load shifts during a journey. You, or a competent person appointed by you, should decide on the most appropriate method of load securing for the load and the vehicle. You should provide safe access (eg working platforms or access ladders) if the chosen method involves drivers or loaders accessing the trailer bed. It’s good practice to involve those actually doing the loading in the decision-making process, as they may be able to identify practical solutions. You may find it useful to develop a loading plan for the loads you transport. It’s important to communicate with both the haulier and the delivery site when preparing the loading plan so that everyone knows what they’re responsible for. Information about the load should be clearly communicated to the driver. You need to take account of possible driver handovers and language barriers. A loading docket that travels with the load may help to communicate information to the haulier and the delivery site. This can be as simple as a sketch showing the position of the load and the load securing system. Many of the same principles will apply if you’re responsible for unloading vehicles. You should think about what happens if a vehicle arrives at your site with a shifted load. Wherever possible, drivers should be involved in the loading process. Their experience may help the loader(s) identify any problems before the vehicle sets out on its journey. Rope hooks are not suitable attachment points. Straps and chains should not be used in the same assembly. First and foremost, it can result in death or serious injury. It can have serious consequences for the driver, other road users, and anyone involved with unloading the vehicle. HSE statistics show that workplace transport is one of the highest risk work activities, accounting for over half of all death or injury incidents reported to HSE. You could be prosecuted for causing the death of an employee or a member of the public due to negligence on their part. Negligence could be viewed as ignorance or the lack of effective processes, like failing to comply with existing guidance. This can result in substantial fines for the company or individuals in the case of a partnership or sole trader. can the load slide or topple forwards or backwards? can the load slide or topple off the side? is the load securing equipment in poor condition? is there anything loose that might fall off? does the vehicle present an immediate likelihood of causing danger of injury due to its load security or stability? This table shows examples of the different load types, but it isn’t exhaustive. A prohibition prevents the vehicle from being moved until the load securing problem is fixed. When a prohibition is issued, the driver is given a fixed penalty notice. The driver then has 60 minutes to fix the problem. If they can’t do this, then the DVSAimmobilisation policy would be followed with a release fee incurred. Penalty points aren’t routinely issued, but they can be in certain situations, eg where a vehicle is deemed to be in a dangerous condition due to the condition or suitable purpose, or weight, distribution, packing and adjustment of the load. This offence carries 3 penalty points and a licence endorsement for the driver. The court may also give the driver an unlimited fine. All vehicles with load securing issues are dangerous, but some are a more significant risk than others. For example, no load securing on a flat-bed vehicle carrying a load of steel would be considered substantially more dangerous than a curtain-side vehicle laden with a few loose bags of clothing. The vehicle carrying steel could result in a charge of dangerous condition, whereas a less serious offence might result in the driver being given advice or a verbal warning. Following consideration of any DVSA report, the TC may take regulatory action for failure to comply with the undertaking of an operator’s licence . Disciplinary action could include suspension, curtailment or revocation of your licence. The TC also has the power to take action against a driver’s vocational licence, such as a suspension. Not only will this have an adverse impact on the driver, it might also create additional problems for the operator. Prohibitions also adversely impact on an operator’s compliance risk score (OCRS). The structure of a standard curtain-sided vehicle or body is not normally strong enough to provide enough load securing, even if load-retaining curtains are used. The curtains should be considered as nothing more than weather protection. The vehicle should be loaded as you would load a flat-bed vehicle without curtains. Lighter goods can be contained to a satisfactory level via the hanging straps or the use of inner curtains (see light palletised goods). Heavier goods should be secured by lashing or other methods like load-rated nets with integral straps. Whatever method is chosen, it should restrain half the weight of the load to the side and rear with 100% retained to the front. In most cases, the load carried will dictate the best way to secure it to the vehicle or trailer bed. Tests on ordinary trailers show that its weakest point is its frame, and this is most likely to fail. This highlights the limited benefits of attaching stronger curtains to ordinary trailers. XL rated bodies display stickers in prominent positions. 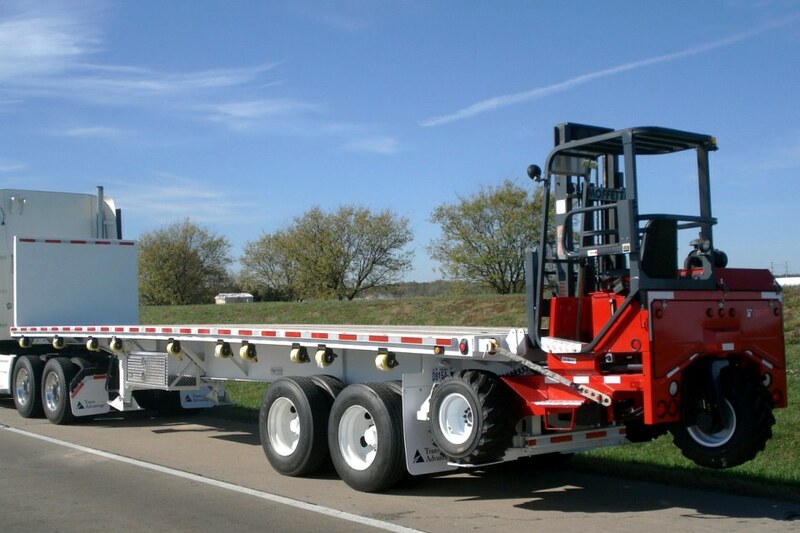 Trailers and vehicles that have been constructed to the EN 12642 XL standard are rated to withstand a minimum of 40% of the rated payload to the side, without additional load securing when used in accordance with the manufacturer’s directions. DVSA will accept an EN 12642 XL rated vehicle/trailer to retain 50% of the rated payload without any extra securing, as long as the load fills the entire load area to the front, rear and to within 80mm of the side (this is often called a ‘positive fit’). The EN 12642 XL standard refers to the entire vehicle or trailer and not just the curtains. So, reinforced curtains fitted to an ordinary trailer do not meet the XL standard. 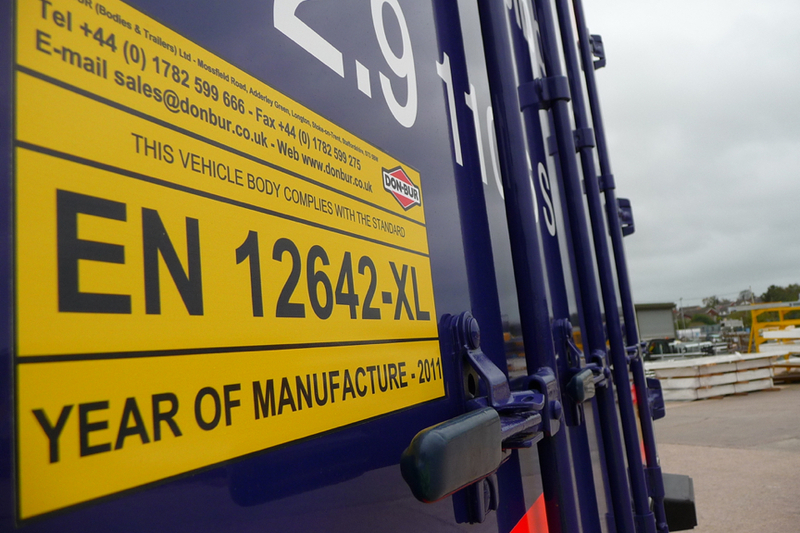 XL rated bodies display stickers in prominent positions (usually on the rear door). It says ‘This body complies with the standard EN 12642 XL’. They’re also given a certificate, specific to the vehicle tested, from the appropriate body responsible for testing vehicles and trailers to the standard. The Vehicle Certification Agency does this in the UK. Some vehicles are tested to a higher standard to that described above. In these cases,DVSA expects the operator or driver to be able to prove this at the roadside by showing the relevant certificate. Double-deck trailers are designed to optimise the available space in trailers. This reduces the carbon footprint and improves efficiency. These benefits have led to an increase in their use over the last few years. Working at height can be problematic on any vehicle, however double decks present particular problems. Operators and consignors (the person sending a shipment) should make sure that a thorough risk assessment has been carried out to identify the most practicable means of loading and securing goods on the vehicle. 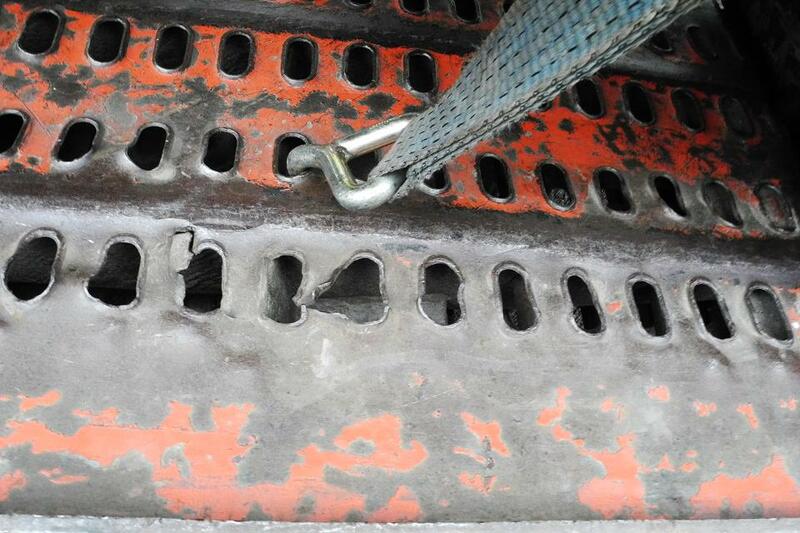 Securing solutions are available to help to mitigate the risks of working at height on double deck trailers. For example, netting and strapping systems that attach to the trailer roof and can be pulled into place over the load and secured to the vehicle chassis from ground level allow goods to be secured without accessing the load bed. Laden pallets should not be stacked on the upper deck. Heavy pallets and stacked laden light pallets on the lower deck should be secured by rave to rave lashing or similar. RHA, TPN, APN and enforcement bodies have agreed that the use of an extra internal curtain with integral straps designed to hug the load on the upper deck is a practicable means of mitigating the risks of falling objects during unloading and working at height. This arrangement can be used by any operator or trailer manufacturer. It’s recommended particularly for new trailers, but can also be fitted retrospectively. The benefit of the internal curtain with integral straps is that it contains the pallets more effectively than using internal straps alone. This improves safety both on the road and in the workplace. Your risk assessment may indicate that for light goods or crushable loads it’s practicable to use hanging straps or internal curtains on the lower deck. This guidance is the minimum requirement needed to secure loads on existing double-deck trailers. You can decide to use other methods of securing the load as well as those in this section, eg rated ratchet straps. Vehicles with rigid sides are no different to any other vehicle when it comes to load securing. Load securing requirements still apply. Most rigid-sided vehicles have a gate-type system. The security of the sides relies on ‘locking’ the sides to an anchor stanchion or stanchions fitted to the bed of the trailer. These items must be kept in good condition. Any defects must be repaired at the earliest opportunity if the load securing relies on the sides of the vehicle. Loads stacked above the height of the sides of the vehicles need to be secured to the vehicle by other means – usually by over-the-top lashings. The sides of the vehicle cannot be relied upon to secure this type of loading. Loads above the height of a vehicles sides can affect stability and will raise the centre of gravity. Box vans and rigid-sided vehicles offer some load security, but you need to consider the effect of a load shift on vehicle stability. Goods carried in containers should also be secured to prevent movement during a journey. Tarpaulins or netting/sheeting should be used on tippers, bulk containers and skips to stop loose items from falling. Goods should not be loaded over the height of the sides of the vehicle or skip. Euroliner semi-trailers have an internal frame running down their length, usually hidden by standard curtain sides. Different sized beams (made of aluminium or wood) can be placed in the frame, either lengthways – to strengthen the side – or across the width of the vehicle to separate the load. Additional securing could include rated lashing (heavy duty) straps attached between raves (hooks), or other approved methods. The transport industry and the loads carried are extremely diverse, so it’s very difficult to provide generic guidance on load securing that covers everything. Many sectors of the industry have specific problems which require bespoke solutions to follow the DfT and EC guidelines. It’s important to think about load distribution and load stability at the planning stage. The centre of gravity of a loaded goods vehicle tends to be much higher than that of a passenger car. This makes a goods vehicle more likely to roll over than a car at the same speed. Single items with a high centre of gravity (eg large plant equipment) should be transported on low loaders to minimise the unbalancing effect. Loads that are free to move from side to side within a vehicle can result in serious stability issues, even if the load is contained within the vehicle body. 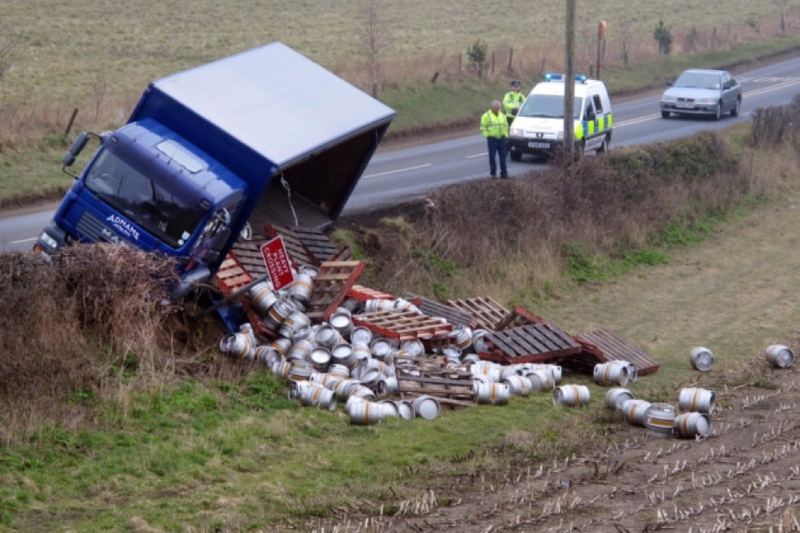 The movement of live loads (eg bagged sand or aggregate, hanging clothes or meat) can result in a ‘pendulum’ effect that quickly leads to vehicle rollover. Rollcages can cause particular problems if they are not secured. Pallets are widely used to carry all manner of goods, mainly because they are a safe and convenient way to store and move goods around via fork lift trucks. Often the goods on the pallets are shrink wrapped to restrict movement during transit. However this wrapping does not provide any load securing. You need to secure the load to reduce the risk of harm as far as is reasonably practicable. Stacked light palletised goodsneed to be secured in the same way as palletised goods over 400kg. The best way is to use over-the-top lashings secured to the vehicle chassis or rave-to-rave. Securing some products may present additional challenges, particularly if they’re susceptible to strap damage (see crushable loads). On double-deck trailers with inner curtains, light pallets should be carried on the top deck with heavier pallets or goods secured on the lower deck using over-the-top lashings. Irrespective of the weight of a pallet, you should consider the centre of gravity. Pallets with a high centre of gravity need extra strapping because of the potential for the load to be unstable, which increases the likelihood of movement during transit. Loose items (eg single pallets, pump trucks or chains) on flat beds need to be secured by other methods, as the internal strapping system or curtains will have no effect. Inner curtains tapered at the roof of the trailer are known as ‘load hugging’ curtains. These are used by some industries to secure the loads carried. There will also be an outer curtain on these vehicles for weather protection as the inner curtains are constructed of nets and securing straps. These vehicles and trailers are commonly found in the drinks industry and are covered extensively in the FTA guidance document (see the drinks industry). Once loaded onto the vehicle they need securing to stop them from moving. This is often done using securing bars, lashings or other suitable methods. This is a particular problem with partially loaded vehicles (see diminishing loads) and presents further problems when unloading. You should take appropriate steps to stop movement of the roll cages to the side, front and particularly to rear. To prevent goods being damaged care should be taken to stack products within the footprint of the cage. Damaging the goods can lead to the loads becoming loose and causing further problems when off loading. These spread the load to allow the load to be secured to the vehicle bed. Crushable loads could need extra protection (eg shrink-wrap or other packaging) to be protected enough to be transported. Netting systems (with straps interwoven through the netting) can be used for these loads. Other methods or other vehicle types may need to be considered for crushable loads. There are some loads which are very unlikely to cause any load securing problems while in transit in curtain side vehicles, eg small amounts of polystyrene insulation. It’s still important that the load is stopped from moving due to the danger to the person responsible for unloading the vehicle. You might not be able to use traditional lashings because of the damage they would cause. However, internal straps may retain the load sufficiently dependant on the size of the objects. The DfT code of practice requires 50% of the load to be secured to prevent rearward and sideways movement. When an entire load is delivered in one drop using the appropriate securing, it’s quite straight forward. However, this becomes more difficult for vehicles involved in multi-drops or carrying diminishing loads. Multi-site deliveries can cause issues with responsibility for the safety of the load. Diminishing loads should be accounted for at the planning stage. You should develop a clear system of work and communicate it to all parties so there’s no misunderstanding about what should be done at each delivery. So it’s important that the driver has enough appropriate securing with them to be able to fix the problems caused by diminishing loads. The whole process can be made much easier if the vehicle is loaded correctly in the first place. If the load is removed in a hap-hazard way, gaps may appear that could be detrimental to effectiveness of the load securing system. If this happens, the driver might find it easier to use dunnage or blocking to fill the gaps, and keep the integrity of the original security. The other way to keep safe would be to reload the vehicle and reapply the chosen securing. This shows why it’s important to plan properly, load the vehicle correctly and make sure the driver has enough load securing equipment. A diminishing load from the rear causes extra problems, as the rear of the trailer won’t provide any security once the rearmost part of the load has been removed. Loads can be secured by cross over straps, kites or sails to comply with the 50% requirement. The strapping needs to be maintained as the load diminishes or an intermediate bulkhead could be used. Drivers should be wary about axle overloads when removing large portions of the load from either the front or the rear. The remaining load may well need re-distribution to avoid these situations. You should carry loads like wood chippings, pellets and grain in solid-sided vehicles and curtain-sided vehicles specifically adapted for that use. These vehicles have additional strapping and covering to secure the load within the vehicle. The likelihood of such items becoming insecure is unlikely if carried in a covered secure containing trailer. Grain carriers and vehicles servicing the wood processing industry will have this type of vehicle. Most will have a blowing system fitted to the vehicle to load and unload the vehicle contents into a storage unit. Standard curtain-sided trailers should not be used for this kind of load. Equipment carried on vehicles (eg Hiabs, fork lift trucks and pallet pump trucks) should be properly secured when not in use. Hiabs should be deactivated and correctly seated and not used as part of the load securing system. Pallet pump trucks should be secured in the same way as the rest of a vehicles load i.e. with lashings or other suitable methods. Lorry-mounted fork lift trucks (often called ‘moffetts’) should be secured using the manufacture’s recommended instructions. It’s recommended that skips are carried on skip lorries wherever possible, as it can be very difficult to adequately secure a skip on a flatbed vehicle. 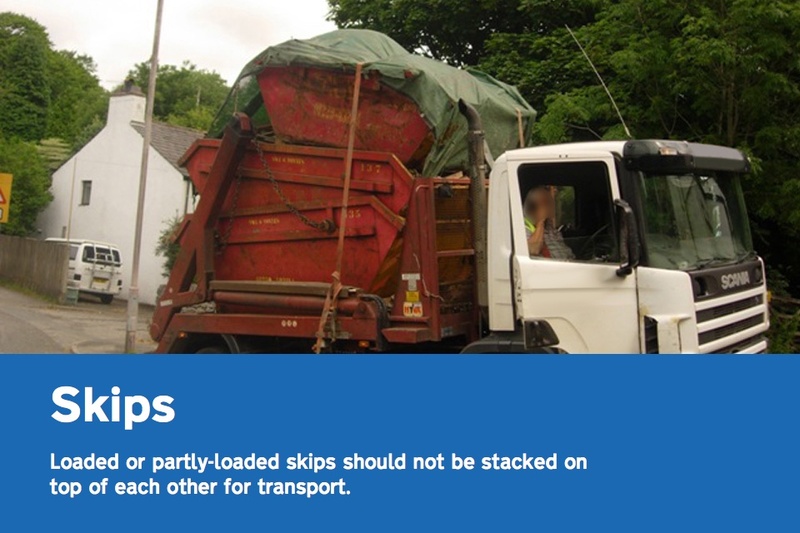 Loaded or partly-loaded skips should not be stacked on top of each other for transport, even on a dedicated skip lorry. The lower skip does not provide a stable base and there is a risk of the upper skip/skips moving under sudden braking, or falling from the side of the vehicle under a combined steering and braking manoeuvre (for example, swerving to avoid another road user). Some skip lorries have a shaft connecting the upper ends of the lifting arms. This is used by some operators to ‘press down’ on stacked skips. This is not recommended. Using the lifting arms for load restraint can lead to fatigue, which could lead to cracking in the lifting arms. Fatigue cracks can grow very slowly and the lifting arms will still operate normally. Eventually the crack will grow to the extent that there’s no longer enough strength in the arm to hold the weight of a skip, and sudden and unexpected failure of the lifting arm may occur. The lifting arms of skip lorries should be inspected every 12 months by a competent person in order to comply with the Lifting Operations and Lifting Equipment Regulations 1998. FIBCs, sacks and other bulk bags can become unstable during transport due to the loads settling. This could put the driver or anyone else unloading the vehicle at risk. The most appropriate vehicle for this type of load would be a rigid-sided vehicle with securing supplemented by lashings. When using drop-side vehicles, make sure the tail boards, hinges and any fastening mechanisms are in good condition. You might also need to consider additional security if the load is higher than the side of the vehicle. Also consider using tarpaulins to prevent any loose loads being blown from the FIBCs. These loads should be loaded to the headboard if they’re carried on flat bed vehicles. To stop movement to the side, use lashing straps with edging strips or some other method to disperse the pressure from the strap onto the load. Tarpaulins rated for load securing with inter woven rated straps can also be used to provide effective security. Due to the nature of the load it is good practice to check for movement during a journey. FIBCs carried in curtain-sided vehicle present similar problems and should be secured in the same way. Other load securing solutions are also available which would be effective for FIBC such as wide straps suspended on bungee cord (see load securing solutions). You may need to put extra sheeting or tarpaulin over the top of the load to stop products from escaping the FIBC if they’re not sealed or closed. Roping and sheeting, used correctly, and using equipment in good condition, can be an effective way of securing FIBCs to meet the requirements of UK and European standards. DVSA recommends that you use rope and sheets that have been strength tested and rated. This is so you can easily prove that the load is secured to enforcement authorities at the roadside. The sheet should also fully contain the load, rather than resting on top of it. Damaged or torn sheets, and frayed or worn ropes, should be replaced or repaired. Passenger cars and light vans should be transported on car transporters. At least 2 wheels of each vehicle should be strapped down using wheel tethers and chocks or blocking at the front and rear of the transported vehicle to minimise the risk of load detachment. You can attach the tethers or lashings to the checker plate, but you should regularly inspect the check plate for wear and tear as the holes can become elongated or stretched. Regularly inspect the check plate for wear and tear. Vehicles transported in a curtain sider should be secured in the same manner using wheel tethers and chocks. Some vehicle manufactures recommend that each wheel should be attached and as such we would encourage transporter companies to adhere to these recommendations. Cars and light vans transported on flatbed or low loader vehicles should be strapped down using wheel tethers on all four wheels and chocked or blocked to the front and rear. 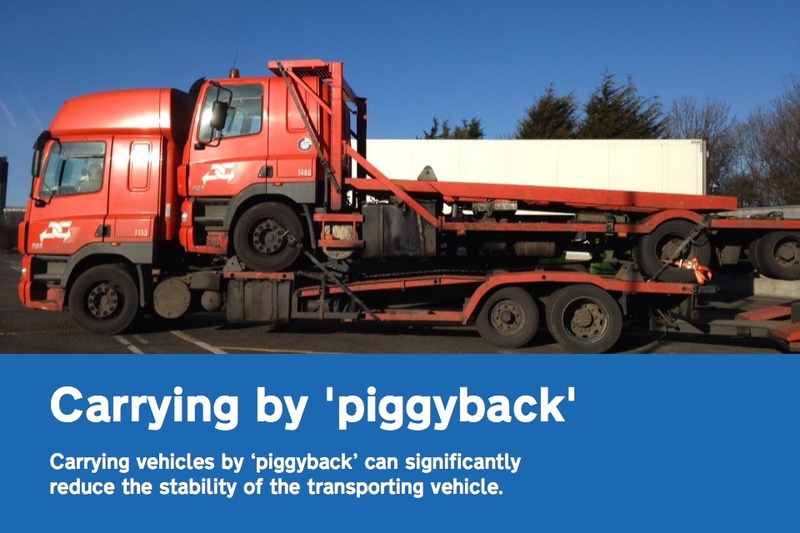 Heavy goods vehicles carried by ‘piggyback’ should be lashed to the transporting vehicle, preferably using chain lashings. Chocks should be used on each wheel if there is no other physical barrier to movement. The transporting vehicle should be a low loader body type and it may be necessary to drive at a lower speed than usual and avoid roads with severe camber or particularly tight bends to reduce the risk of rollover or load detachment. Plant equipment, including agricultural tractors, is usually secured using chains directly lashed to specific points on the carrying vehicles chassis. This is adequate as long as chains are used in opposed pairs – if a chain is pulling in one direction, another chain should be pulling in the opposite direction. There is very specific guidance on securing plant vehicles in the DfT code of practice. Wheel wells and chocks attached to the front and rear of a car transporter can also be used as an integral part of the securing system. You should bear in mind the requirements contained within the Construction and Use Regulations about the maximum dimensions when any equipment is extended to the front or rear of the vehicle. Scrap metal, including scrap cars, should be transported with caution as it’s a high-density load and may often contain sharp edges that can cut through webbing lashings. Chain lashings are recommended for this type of load. The friction between the load and the vehicle load bed is likely to be very low so it’s important to use an adequate number of lashings. This is very important for kerbside deliveries to smaller premises where pedestrians are at risk of being hit. Lashing loads to multi-drop kerbside delivery sites may put the driver at more risk. Other restraint methods should be used if possible. You should transport small and/or breakable items in stillages if no other method can be used. Scaffolding equipment will comprise of poles, boards and ancillary equipment, and is often transported on flatbed vehicles. The load should be placed in contact with the headboard if possible. If a gap is left, an intermediate bulkhead (which can be constructed from scaffold boards), blocking ordunnage can be used to prevent movement, or lashings can be used over the load. Groups of poles should be ‘belly wrapped’ and secured to prevent movement during the journey. Round timber is normally carried on a skeleton type trailers with goal posts. This is allowed as long as the goal posts are in good condition and are secure. As a minimum, each pair of goal posts should be accompanied by over-the-top lashing, either straps or chains, from chassis to chassis. Chains are used for heavy loads like steel, machinery and plant equipment. Steel is a high-density, high-risk load. The consequences of load shift can be extremely serious. 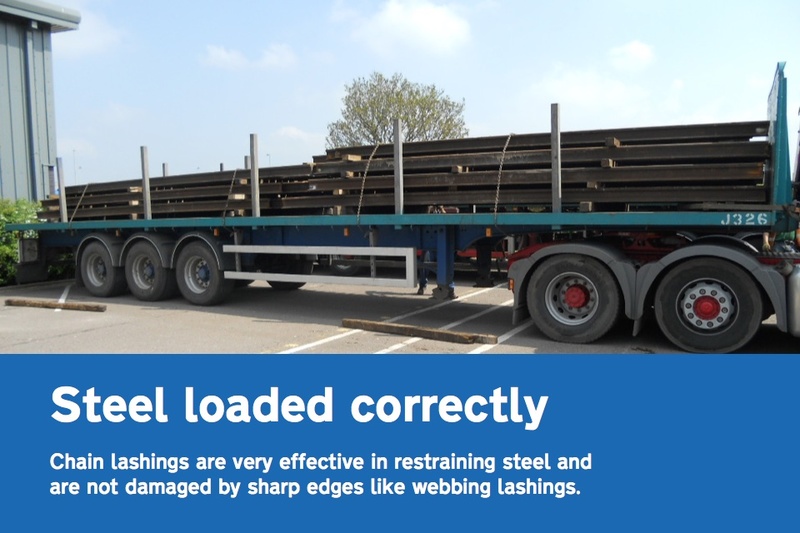 It is very important to load steel so that they are stable on the vehicle without relying on lashings. This may mean using chocks or blocking to make sure the load is stable. Even though steel is heavy, do not rely on the weight of the load alone to hold it in place. The friction between individual items in the load, and between the load and the load bed, can be very low – particularly for painted or coated products and cold rolled products. If the vehicle is loaded in an uncovered area, wet or icy weather conditions can also reduce the positive effect of friction. Steel should be loaded so that it is against the headboard of the vehicle if possible. The headboard should be strong enough to prevent the load moving. If the load comes through the headboard it will go into the driver’s cab, the headboard is critical in protecting the driver. For the same reason, the load shouldn’t be loaded above the height of the headboard unless precautions have been taken to stop it sliding forward. The load should be secured with chain lashings when it’s loaded. Belly-wrapping is particularly useful in securing bundled products. Side posts or side boards help to protect both other road users and unloading personnel. They’re a useful way of making sure the load doesn’t endanger anyone if the lashing system fails for any reason. Steel can be unloaded by fork lift truck or by crane. Since the DVSA and Health and Safety Laboratory initiative on load securing there has been a large increase in the number of load securing solutions available. These range from systems which reduce the risk of working at height including lashings suspended from bungee cords to specially designed extendable poles used to help the driver. All of these are valuable tools to help you secure awkward loads to vehicles to reduce the risk of load movements and associated road safety problems. All equipment used to secure a load to a vehicle should be in a good serviceable condition. Damage to the equipment should be reported and the equipment replaced as soon as reasonably practicable. You should regularly inspect the state of the vehicle headboard or any other internal bulk head (if used). Curtains should be inspected and where rips are identified they should be repaired as these will compromise the curtains ability to contain a load should a load shift occur. When not in use, the equipment should be stored safely or secured to prevent it falling from the vehicle during transit. The DfT code of practice requires that the load securing systems used should be able to withstand a force not less than 100% of the load to the front. Generally, but not exclusively, vehicles will rely on a headboard/bulk head or intermediate bulk head to provide this security. You should regularly inspect the headboard to make sure it’s in good condition. Different vehicles have different types of headboard and not all are suitable to retain 100% of the load. You should make sure that the headboard fitted to your vehicle is strong enough for the load being carried. To take the full advantage of the bulkhead/headboards loads should be located as close to the bulkhead as possible. However this might not always be possible due to the potential for exceeding weights or due to the nature of the load itself. In situations where the load is not located up to the headboard then ideally suitable blocking or dunnage should be used to fill the gap. The type of blocking used will be dictated by the load carried and the size of the gap i.e. the larger the gap the more robust the blocking would need to be. In some circumstances it would be appropriate to use additional lashings to secure the load rather than blocking. Another issue to consider is the height of the load in relation to the height of the headboard. Where a vehicle is laden with a large indivisible load the headboard can provide support as long as the load cannot topple over the height of the headboard. If the load could topple over the headboard then additional securing will be required, such as cross strapping to the front, if indeed the chosen vehicle is suitable for the load. Rope hooks are for securing sheeting to the vehicle, with ropes or nets attached to protect the load from the weather. They should not be used as an anchor point to secure over-the-top straps or chains. Drivers who have traditionally ‘roped and sheeted’ a load using the ‘klinch’ or ‘drivers’ knot can use the rope hooks to secure the load to the vehicle if this system is sufficient to do so. Many drivers do not have the knowledge or ability to rope and sheet as more effective systems have become available. Ropes showing signs of wear should be replaced at the earliest opportunity. Lashing straps should attach either directly to the vehicle chassis or rave.